One of the delights of being a Mac fan is the availability of small, lightweight applications that provide specific, useful functionality to improve your computing experience. With Apple’s traditional strengths in the area of music and video, many of these apps look to improve your media consumption experience, and Boom falls squarely into this market. 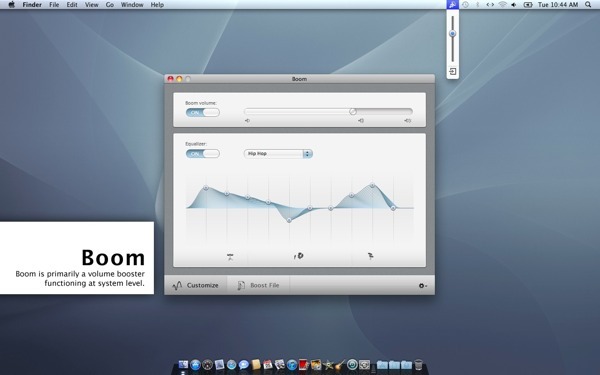 It’s a very simple idea – Boom will boost the volume of the audio from your Mac. Naturally, it fits best with those Macs that have a limited internal audio capability such as the Mac Mini or MacBook laptops, though it works just as well on any Mac in the range, even if you have external speakers attached. Installation is a simple affair, and the app has a well-designed, clean aesthetic that its well with OS X. After installation, you get a menu bar icon that allows you to adjust the boosted volume, as well as getting to the app preferences. As well as volume boosting, Boom provides an in-line equaliser function with a good set of presets, though you can adjust the equaliser curves yourself if you wish. In use, I found it best to set my Mac’s standard Apple-provide volume controls to maximum, and then rely on Boom for fine volume control. The app supports keyboard shortcuts allow you to replicate the function-key volume adjustment that Apple provides. I’ll admit I was a bit skeptical before I installed it – after all, you would think that sound reproduction through internal speakers is primarily constrained by laws of physics that can’t be adjusted by software! 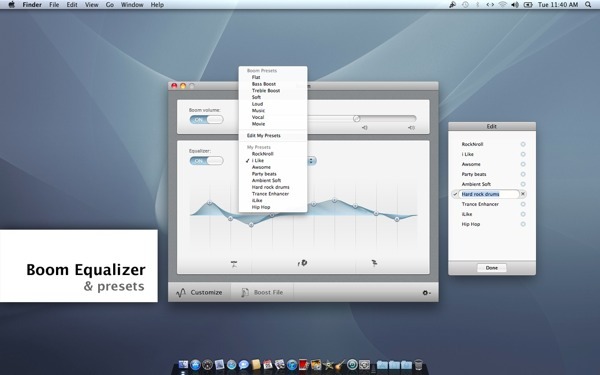 However, on both my 2011 Mac Mini and my 2012 11″ MacBook Air, Boom was able to provide substantial volume increases – enough to make the playing of music on the machine while wandering around a good sized room a reasonable proposition. The effect was especially impressive on the Mac Mini, which has a really weedy internal speaker. Even better, the volume improvements were delivered without any distortion at the top settings. I also found that the volume increase when using external speakers or headphones was also useful. The equaliser also worked well, making noticeable changes to the music. However, I do view this as less useful – it’s a global setting to your Mac’s output, whereas using iTunes for equalisation allows you to have equalisation on just your music while leaving audio for video untouched. I did encounter a single occurrence of audio stuttering while using the equaliser, but I wasn’t able to replicate it, so it is more likely to be a transitory glitch on my machine than an inbuilt problem with Boom. If you occasionally want to listen to media out loud on your Mac Mini or Mac laptop, and don’t want to bother with the cost or extra effort of external speakers, Boom will deliver what you want at a reasonable price. Even if you move on to external audio devices in the future, Boom will continue to deliver. I believe that utilities such as this represent all that is good about the Mac application market.